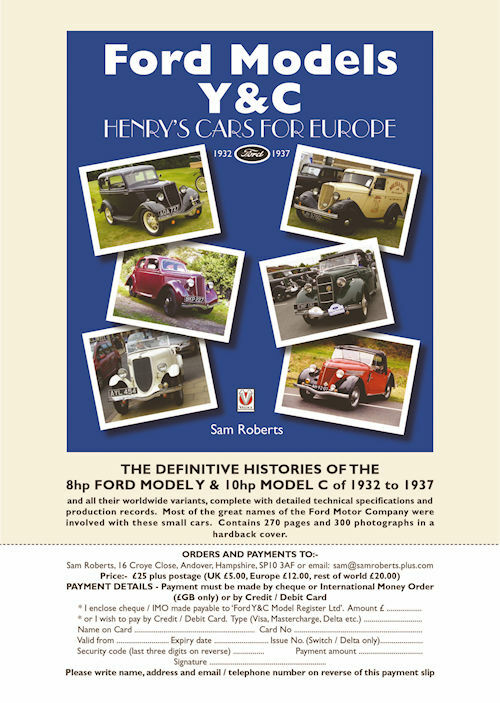 This excellent book was written by our club historian, Sam Roberts, and is published by Veloce. It can be ordered by downloading the order form at the bottom of the page. The cost of the book is £25 + postage. "The fascinating account of the conception, development, production, and assembly of the first Fords designed in the USA specifically for a foreign market. In-depth research by the author - particularly in Dearborn, USA, the cars birthplace - has allowed him to relate the full story of why the Model "Y" was necessary, its speedy introduction, chequered first year and development into the market leader in Great Britain, being the first and only saloon car to be sold at the remarkably low price of £100, and setting a benchmark for other manufacturers throughout Europe. The story of the supposed successor to the Model "Y", the Model "C", is also told, including its advanced design concepts and less than successful time in production. The background to each of the Ford plants where the cars and their variants were manufactured and assembled, in England, Europe and the British Empire, is also described, highlighting failures and successes in a world hit by the great depression and political turmoil of the 1930s. An essential reference for early small Ford enthusiasts and those with an interest in the Ford Motor Company in the first half of the 20th century, this heavily illustrated book (over 330 photographs and illustrations) relates the story of the milestone cars that changed the course of automotive history forever. Detailed technical specifications and production records are included"